Daniel Nocera of MIT and his team announced this week the latest development in their quest for the holy grail of solar energy. Mr Kan told parliament the situation at the quake-hit plant “continues to be unpredictable”. The government “will tackle the problem while in a state of maximum alert”, he said, adding that he was seeking advice on whether to extend the evacuation zone around the plant. The terrible dilemma is that the reactors must be continuously flooded with water to avoid much worse melting – yet that water is what is carrying radioactive materials outside the plant, into steam, and groundwater. 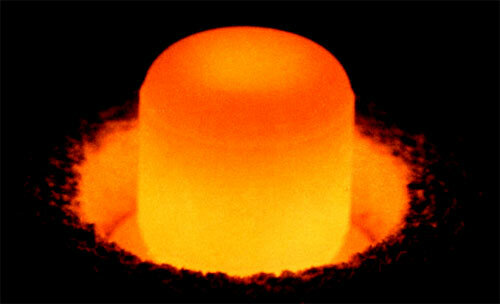 Plutonium has now been discovered outside the plant boundary. This is human scale technology. Simple, elegant, inexpensive, and applicable throughout the third world, and in agricultural regions here in the first world. Oh, I forgot, – carbon mitigation was going to make the third world miserable … got to keep the talking points straight….. In this interview from Saturday, Candy Crowley makes one mistake, quoting a report, current as of when she stated it, that radiation on site was “10 million times” above normal. That erroneous number has since been lowered to a mere 100,000 times normal. The rest of the interview is still current, and with todays news, maybe even more urgent. TEPCO is now, apparently, admitting that there may be core breaches at 3 of the afflicted reactors. Japan’s location on the Pacific ring of fire obviously carries risks, as we’ve seen. But there’s a blessing as well, which may point the way for clean, reliable power in the future. 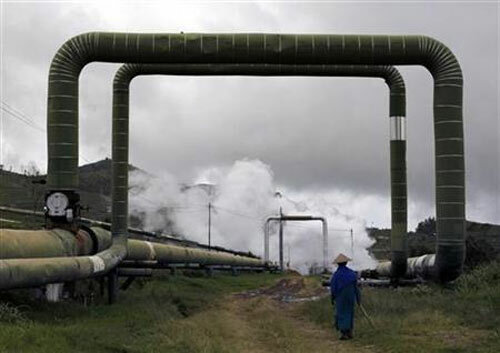 The article points out that the cost of geothermal is high. But when the costs of the current accident are finally tallied, it might look better than more nuclear investment. There is no doubt that temperatures are rising, and basic physics suggests that warmer means wetter, because warmer air can hold more moisture.Observations confirm that the lower atmosphere holds about 5 per cent more water than a century ago, giving it that much more ammunition to unleash in a downpour or blizzard. So does this explain the recent floods? “I don’t think it is legitimate to assume that climate change played a role in these events until we’ve done the work,” says Myles Allen of the University of Oxford. There are many types of floods, he says, and while climate change is making some extreme events more likely, others – such as floods caused by melting snow – may become less likely. New Aerial footage from the Japan Self Defense Force, taken Sunday, March 27. • much closer view of the extensive damage to the buildings where explosions have occurred. • at reactor number 3, the crain used to transport nuclear fuel assemblies appears to have collapsed into the nuclear fuel pool, making fuel rod damage almost certain. • at 2:20 in the video, we are shown what appears to be the “lid” of the containment vessel in the number 4 reactor, lying on its side in a pile of debris.